Dynomax's Super Turbo system is a Single 2.25" system with a Super Turbo Muffler. Intermediate pipe needed to complete installation (not included with kit). Great Performance, Great Sound, Great Price! All Dynomax systems are true bolt-ons, designed to attach directly to existing mounting points for an easy installation. They follow OE routing and feature top-of-the-line performance mufflers, mandrel-bent pipes for smooth exhaust flow, and all-aluminized materials for longevity and better appearance. 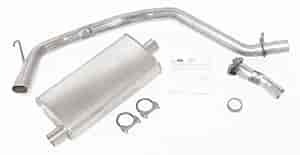 Dynomax SS Exhaust Systems are made completely from stainless steel. Each kit is dyno proven to make more horsepower & torque. Free flowing Ultra Flo Welded mufflers and mandrel bent tubing increase performance & fuel efficiency. Dynomax Super Turbo systems feature Dynomax's flow director technology with large internal flow tubes which eliminate turbulence and improve exhaust flow while reducing backpressure. The fiberglass matting gives the Super Turbo a mellow performance tone. Dynomax Ultra Flo Welded systems feature a stainless 100% welded muffler that uses a straight-through design that ensures unrestricted air flow and reduces back pressure. These systems have a deep performance tone. Dynomax Ultra Flo systems feature a seamed, un-welded, 100% polished stainless muffler that uses the same straight-through design of the Ultra Flo Welded systems. These systems have a deep performance tone and will support up to 1,900 horsepower. Looking for Car Bolt-On Exhaust applications? Click here. Does Dynomax 17415 fit your vehicle?